Greetings friends, this week has brought several updates to the Overflow site. The 'CD of the week' page is now up to date, as is the playlists page. There is also a brand new page for you to tackle... yes there are some strange things on Deck 5... including the lastest addition 'The Starship Overflow' page. Here you will find the history, the stories, the facts and the reasons! More new pages coming soon, here at The Starship Overflow! PEACE! PS: We have been testing a new method of streaming this week, with hope of having an extra internet outlet for special occasions. Unfortunately, the software was'nt up to scratch, George electricuted his foot (did'nt know he had one) and Zippy The Hippy has gone into a sulk and hidden Paul Windsor's pipe, stolen Tim Rice's VW Camper and left this horrible gooey muck in the studio for me to deal with. If you're reading this young Zips, be warned, when we get hold of you, we are going to force you to listen to local radio and torture you with 'Monster fruit'. ...And if you dont know what a monster fruit is... scroll down and try not to imagine the pain! Monster fruit, botanically known as the split leaf philodendron, Monster is also known as Monstera deliciosa, Mexican breadfruit. 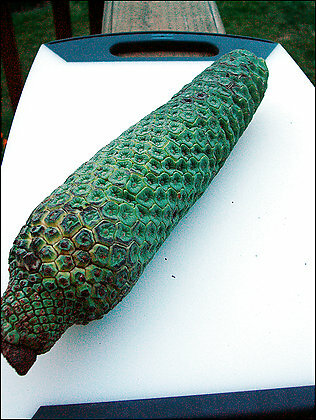 Shaped like an elongated pinecone, with lizard-like scales, the Monster takes a full year to ripen in tropical climates. Even when it's harvested, that doesn't mean it's ready to eat; in fact, an unripe Monster is still saturated with calcium oxalate crystals that can irritate the mouth and throat. When those scales begin to loosen or pop off, that's your cue to start cutting into the flesh - but the weird trip is far from over i'll have you know! Inside you'll find more of those corn-style kernels, resembling a banana in color, aroma and texture. Inhale the perfume, that imaginary "Tutti-Frutti" flavor comes to mind. Take a fork to pull the flesh away; one bite and you'll think banana, pineapple and mango all mixed together. Dr. Umbongo has written a hard-back book of the various tortures involving Monster-fruit, and George is on the rampage. Look-out!